Repelling Bugs With The Essence Of Grapefruit Scientists are working on a new, natural bug repellent. It's non toxic, non-greasy and smells like grapefruit. For insects it's deadly but for humans it's safe enough to drink. It's bug season again. And once again, most people won't bother spraying or slathering on repellents. That bugs the Centers for Disease Control and Prevention because biting insects are more than an itchy annoyance. Tick bites cause 30,000 Lyme disease infections every year. 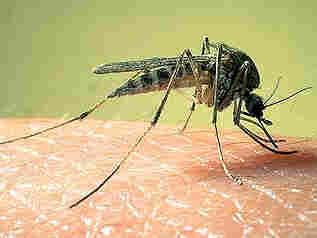 Mosquito-borne West Nile virus causes 600 potentially fatal brain infections a year. People's lackadaisical attitude is due to two things, says Marc Dolan of the CDC's vector-borne infectious diseases laboratory in Fort Collins, Colo.
"It's hard for people to remember to use a repellent," Dolan says. "You know, they don't put a repellent on every time they leave the house." Beyond that, most repellents area hard sell. That's because they contain a 60-year-old chemical called DEET. "People really dislike a lot of the repellents available now," Dolan says. "They don't like the odor they have, they don't like the greasy feel they give. And a lot of people are just concerned about putting man-made chemicals on their skin." That's why the CDC is pushing hard to develop a completely natural insect repellent made from a chemical called nootkatone, which is found in Alaska yellow cedar trees and citrus fruit. Dolan says nootkatone "is nongreasy, dries very quickly, and it has a very pleasant, citrus-y grapefruit odor to it." He recently demonstrated its effectiveness as a mosquito repellent, rubbing some on his hand and then sticking it into a cage containing 50 hungry mosquitoes. When he holds the treated hand near mosquitoes, they try to get away in the opposite direction as fast as they can. Even after five minutes, Dolan has no bites on his nootkatone-treated hand. Nootkatone is also effective against ticks, and scientists think it will work against bed bugs, head lice and other insects, too. Moreover, nootkatone is so nontoxic you could drink it. In fact, it's already an approved food additive, officially classed as "Generally Considered Safe." It's also a natural ingredient in some foods. "If you've had a grapefruit, you've consumed some nootkatone," Dolan says, "or drank a Squirt, for instance." Dolan, who is leading a CDC team to develop nootkatone, says it could be put into soaps and sunscreens, so people wouldn't have to apply a separate bug repellent. But that's not all — it turns out that nootkatone could be both a repellent and an environmentally friendly pesticide. That's because it doesn't just repel bugs — it kills them. Nick Panella, another CDC biologist, recently demonstrated nootkatone's insecticidal properties by coating the inside of a jar with the chemical and then introducing some mosquitoes. Within seconds, they all started to die. "This stuff has incredible knock-down," Dolan says, referring to an insecticide's ability to kill off bugs. "It kills very, very quickly, usually within a matter of about 15 seconds." It kills by blocking receptors on insects' nerve cells for a neurotransmitter called octopamine. That makes the insects hyperactive. "They basically vibrate themselves to death," Dolan says. Humans don't have octopamine receptors, so that may make nootkatone safe for humans, though Dolan says scientists don't yet know whether there's any cross-reaction between nootkatone and adrenaline receptors. Adrenaline is the human analog of insects' octopamine. Dolan thinks nootkatone is likely to be so nontoxic that it could be an ingredient in "the world's first insecticidal soap." "If you come in from your garden, you could shower with this soap, which would not only repel ticks and mosquitoes, or ticks that may be on you," he says, "but ticks that may be actively feeding on you, it would cause them to detach and possibly kill them." Tests so far indicate that nootkatone is highly effective as an environmental insecticide, and not just against mosquitoes. "A single application of a 2 percent solution of nootkatone will control ticks for up to 42 days at greater than 97 percent efficacy," Dolan says. Another advantage, he says, is that nootkatone is volatile, so it doesn't persist very long in the environment. "Essential oils [such as nootkatone] kill bugs and then break down and are no longer active," the CDC scientist says. "So you don't get a lot of soil contamination. We don't see groundwater contamination. And we don't have a high impact on other nontarget insects that may come into the sprayed area, such as bees and butterflies." Finally, nootkatone works in a completely different way from other insecticides, so mosquitoes aren't resistant to it yet — a major problem with current insecticides. The CDC hopes the chemical will be impregnated into bed nets to reduce malaria transmission in areas where the mosquito-borne disease is endemic. The CDC owns patents on nootkatone and has licensed them to two companies — one to develop a repellent, the other to work on insecticides. The agency isn't looking to make much money; its interest is in seeing products get to market. Right now nootkatone is expensive — $4,000 per kilogram for highly purified food-grade material, which is used in parts-per-million amounts as a flavoring agent. Repellents and insecticides would use a higher concentration — perhaps 2 percent. But it wouldn't need to be as purified. Dolan says efforts are under way to find cheaper sources of nootkatone, such as waste products from the citrus and forestry industries. In addition, a different form, called nootkatol, appears to be a lower-cost alternative for repellents. "Nootkatol is just a waste product," he says. "Right now, that's virtually free."